One of the most interesting stories of European settlement in Lambton County comes from an ardent believer in socialist theory, a man named Henry Jones. He brought settlers from Scotland to Lambton County to establish a communal settlement in the late 1820s. Jones was inspired by Robert Owen, a Welsh entrepreneur and social reformer. Owen was disheartened by the wretched working conditions that plagued Britain during the industrial revolution, and introduced socialist reforms in the mill he managed in New Lanark. He provided educational facilities for his workers; started a company store with lower prices and credit; and wrote essays about communes and social living. ﻿﻿﻿﻿﻿﻿ Owen delivered lectures on socialist living, and one of these lectures was heard by our Henry Jones. Jones was inspired to establish an Owenite colony populated with displaced British workers in the New World. Jones encountered some snags on his path to a Utopian commune. His initial petition for land was refused because he did not have enough settlers and demanded extensive government funding; his second petition requested to settle fewer families at his own expense. In late 1828, Jones received his grant, and his settlers set sail from Scotland. The party had approximately fifty men, women and children, including Jones. Elizabeth (Jones) Faithorne Pencil Sketch, Maxwell. The arduous journey across the ocean and through the wilderness took weeks, and the settlers eventually arrived in late April 1829. The settlement was dubbed Maxwell and embodied all the promises of contemporary social reform theory. Their communal home was “a large building of, not logs, but carefully whip-sawed boards. A two-storey central block contained the common dining room, kitchen and living rooms. Two single-storey wings contained private rooms for each family.” [Maxwell – and Henry Jones, Lambton’s Communal Settlement, Helen Burrowes, p. 20]. They had a storehouse for supplies and a blacksmith shop, and the promise of an existence free from the shackles of industrial labour that loomed in their native Scotland. Unfortunately, Maxwell proved to be unsustainable. The women became disgruntled with the communal kitchen and dining room. There were whispers from some of the men about Jones, who saw himself as the group’s leader. Following the tenants of social theory, Jones believed human beings were inherently selfless, hard-working, and good intentioned. It turned out this was not the case. Maxwell’s settlers did not live up to Jones’s ideal. The community began to crumble after less than a year with the departure of Henry Baird, the young blacksmith. More and more settlers would peel off, and Jones became distracted with legal troubles back in Britain. Lambton’s experiment in communal living may have failed, but Jones left a legacy. He is credited with bringing an optimistic spirit of community and freedom to Lambton while the area was still wild and untamed. Additionally, the center street of a lot he owned was subdivided and named Maxwell Street after that fledgling communal settlement. Henry John Jones (Jr) Journal, December 1860. The Lambton Room is fortunate to contain some amazing documentation of the Maxwell settlement and the Jones family. 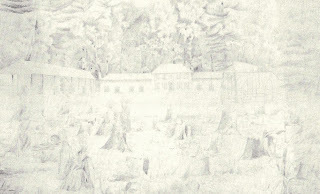 We have two pencil sketches done by Elizabeth (Jones) Faithorne of the original communal settlement in the early 1830s. Additionally, we have a collection of nearly 30 volumes of journals kept by Henry Jones’s son, Henry John Jones. His journals begin in 1830 and keep diligent records of almost every day until 1883. 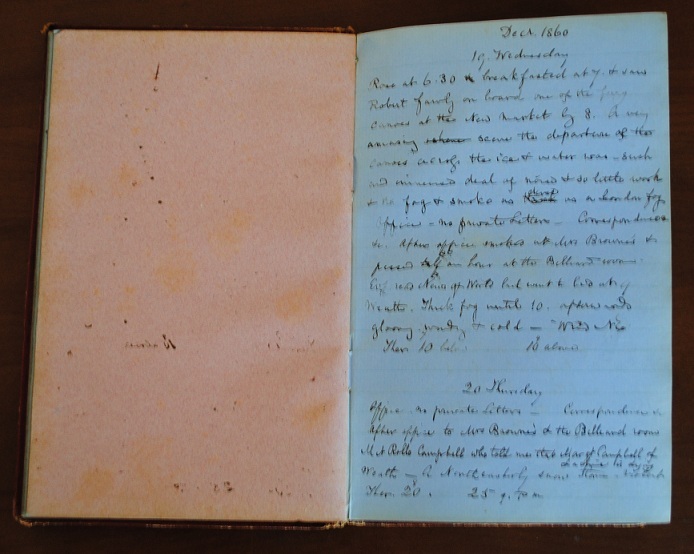 The journals provide information about Henry John Jones and insight into what life would have been like in the 1800s. The collection is occasionally mundane (when discussing the weather); often informative (we learn about trips taken by Jones); and even funny (we sometimes hear Jones bemoan a night spent consuming too much gin). While the Maxwell settlement may have failed, it retains a remarkable and interesting foothold in Lambton County’s history, and has left us some fascinating historical documents.